Rare and incredible opportunity to vacation on LagunaBeachCharmers prestigious Cliff Dr. Escape the troubles of the modern world and live like the locals, where life is one long weekend. Drop your shoulders, recharge your batteries, fill your senses and your tummy, all just steps away from sand between your toes. Find our family business LagunaBeachCharmers. If premier residential location, close in sweeping ocean views, three minute walk to beaches and short walk to Village, no need for car, matters to you, then this is your place, All the other rentals on this site that are lower priced are lower priced for a reason! Enjoy our close-in panoramic ocean view personal deck or maybe you want to try paddleboarding, paddle yoga at Fishermans Cove or Divers Cove, or surfing, kayaking, rent scuba gear, snorkeling gear, get scuba certified, go out on scuba boat, rent electric bikes, all available one block away, have a massage, hike the neighborhood trails, explore the tide pools, go a block to supermarket for adult beverages or healthy indulgences (Husky Boy and Ginas Pizza are across the street for not so healthy; Jan's for super healthy; Reunion Kitchen and Asada for incredible meals; Blk Dot Vietnamese (strong,) coffee), and more, all just doors away. Besides our sandy beaches, if you are a small family, you can tour Disneyland and Legoland, we are located between the two. Then put the exhausted kiddies to bed and have after-hour cocktails on our deck, enjoy our 200+ channel TV in the comfortable living room, or relax in our cozy romantic master bedrm. This cottage is a newly furnished in coastal appropriate appointments, with panoramic ocean views on prestigious Cliff Drive. One queen bedroom with hotel linens, full bath, granite kitchen with all the amenities, and beautiful trestle beams and hardwood floors throughout. Grand living room, with trundle twin beds suitable for minors. Master bedroom, living room plus personal deck overlook the ocean. All linens provided. YES, WE HAVE FREE WIFI. We provide beach chairs and beach towels. Coin-operated laundry on premises shared by two others. Walk one block to the beach and to the entrance of Heisler Park, perched along the waves for a breathtaking short walk to the enchanting Laguna Village with restaurants of every category, high end or taco stand, and local shopkeepers. Free summer daily trolley (July and Aug) otherwise weekend only trolley, stops right across the street. WE ARE 1 of 36 LEGALLY PERMITTED VACATION RENTAL BUILDINGS BY THE CITY OF LAGUNA BEACH. WE GUARANTEE YOU WILL NOT BE SHUT DOWN PRIOR TO OR DURING YOUR STAY AND FORCED TO FIND A LAST MUNUTE HOTEL. We have been a vacation rental since 2000. We book up early and quickly. We have a strict no smoking policy on the whole property. City of Laguna Beach also has a strict non-smoking policy everywhere in the city. This includes e-cigarettes, vaping and all other types of smoking. Sorry we cannot accommodate pets. We allow four people maximum overnight. Our rates are double occupancy. Please check our rates section and rules and poesfor details. We are not suitable for partying groups. Our mission is to offer a "live like a local" awesome beach vacation while at the same time being located in walk-friendly north Laguna Beach. Do not be concerned that the property backs up to the iconic Hwy 1. It is not a traditional "highway" . It is the state coastal Highway 1 / 101 that weaves up the coast to Canada. In Laguna Beach it is just an ordinary main artery street with stop lights every couple of blocks. There is a garden courtyard buffer between the street and the cottage and the Bedroom and Living Room or on the Cliff Drive side and overlook Cliff Dr and the ocean across the street. Laguna Beach is consistently among the top 10 beach resorts in the U.S. The Laguna Beach beach-side lifestyle is all around us, not partying groups that are so popular in our neighboring towns, but if you are coming here for a quiet experience our place is not for you. 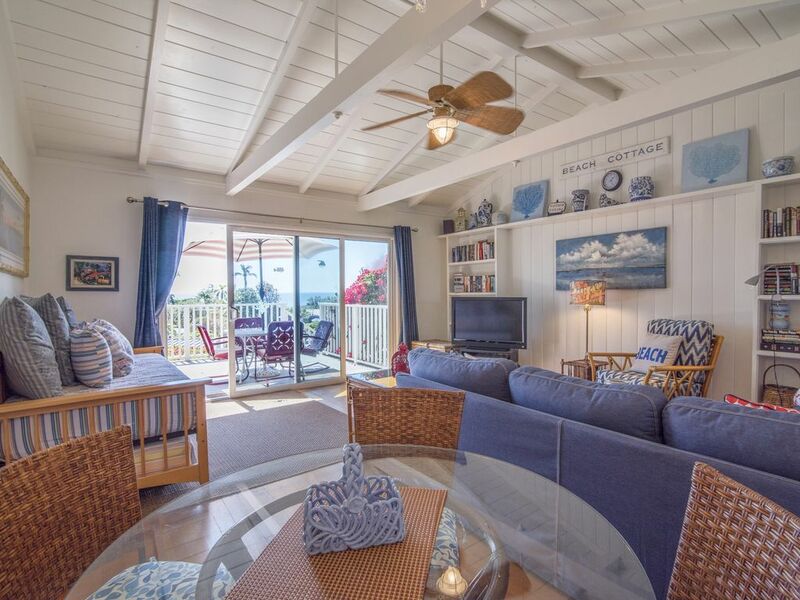 LagunaBeachCharmers cottages are for visitors looking for a vibrant beach "live like a local" escape with all the excitement and amenities of a bustling, popular, upscale Southern California beach town. At times there will be trucks, trolleys from the free trolley route we are on, occasional construction or barking dogs, or loud motorcycles (whose revved up riding is forbidden in Laguna but they do it anyway), or more, that pass by our cottages and by our immediate neighborhood of $5M+ homes. More than half of our guests return time and again. Also, while we have great street parking in front of the building for eight cars, in the warm weekend months those places fill up fast with beachgoers. Please be patient and a place will open up for you usually after 5 PM until about 10 AM. Weekends are the busiest. Once you are at the cottage, unless you are taking day trips, you will rarely have to move your car as we are a "walkability" neighborhood. Also, unusual for homes in Laguna Beach, we have installed central air-conditioning! We have a very mild temperature range but there will be an occasional heat wave. We also have portable fans and ceiling fans. If you wish to have an incredible stay and need a two bedroom, please check out our listing 310136. It's perfect for four people or a couple with two older children, not suitable for children under seven. Or have a great great experience and book for both cottages for up to 8 people. We were fortunate to find a fantastic coastal vacation home location on the renowned California Riviera. We have specactular close in, panoramic ocean views combined with adjacent beach access as well as close walking proximity to the charming Laguna Village. We have traveled to many coastal areas throughout the world including southern Spain, the coastline of Italy, Sicily, Gibraltar, French Riviera, South American Atlantic and north Africa, Western Spain and France along the Atlantic as well as up and down the California Coast, Oregon Coast, East Coast and Mexican Riviera. Whenever we are home here in our vacation spot of Laguna Beach, we marvel how this spot is one of the most spectacular we have seen in the world, if not THE MOST SPECTACULAR place on earth. Yet, Laguna Beach remains a small beach town...but with sophisticated restaurants and amenities. One can relax in quiet serenity or find stimulating activity and entertainment all minutes away. Divers & Fisherman's Cove Beaches with whitewater and waves rolling onto the sand. Nearby Shaw's Cove is popular with scuba divers. Sweeping close in ocean views from Dana Point and north up the coastline. There is a coin operated washer and dryer in the laundry room just outside the back door of the cottage. It is shared with two other cottages. Coin operated washer and dryer in laundry room outside the back door of cottage. There is ample street parking all along the curb in front of the building. It is not metered nor time specific. All towels, bath towels and beach towels provided. Beautiful inviting tressel beamed ceiling living room, two sofas plus comfortable chair, flat screen with dozens of channels, awesome ocean views, opens to personal deck. Fully equipped with full compliment of dishes, glassware, utensils, pots and pans. New Kitchen w/ granite counter tops, full stainless steel refrigerator/freezer, and stylish new stove and newer dishwasher, pantry and fully stocked w glasses and dishes for all occasions. There is a dining area at one end of the living room off the kitchen as well as al fresco dining on the personal deck. Both areas seat four. There is a dining table on the lower brick patio. New 40' flat screen w dozens of cable channels, Netflix, Amazon, Hulu, etc, access. Courtyard garden off the kitchen in back of the cottage. Personal deck to this cottage with fantastic close-in ocean views is off the living room. Hi Antoine, Thank you for taking the time to post a review on our cottage. We appreciate that you joined us and maybe we will see you again one day! We hope Laguna Beach will hold fond memories for you for many years. My sister and nephews had a great time in this beautiful beach cottage. The location is amazing - less than 5 minutes walk to 5 beautiful beaches, with one just steps away. The cottage is fully equipped and ready for a relaxing beach vacation. Enjoy! The perfect Laguna Beach escape! We had an amazing vacation staying in the one bedroom cottage. Everything was perfect, and as pictured...except the view- no photo could really do the ocean view justice- go and see it yourself, you will not be disappointed! Working with the owners was smooth and easy. They answered everything timely and were so easy to deal with. We will will definitely return and rent again this lovely cottage. We felt like a local and loved the vibe of Laguna. the pictures don't do justice to the amazing view! This is a magical place, perfectly located--a 10" walk to the Village, right on Cliff Drive with walking access to a number of coves. There is a deck (with BBQ and table) with a wonderful view as well as a larger patio one level down with deck chairs and a larger BBQ. The view continues from inside: both from the living room (which opens onto the deck) and from the BR. The apartment is comfortably furnished, lots of books (mainly detective and thrillers), Turner Classics on the TV and a very well equipped kitchen. The apartment backs onto the Pacific Coast Highway but noise is not a problem. There is access to a washer and dryer (which take coins) and there is easy street parking on Cliff Drive. Pavilions supermarket is just a few blocks away with lots of parking. The owners are very helpful. All in all a wonderful month despite the weather. My wife and I decided to get away after Christmas for a week and we picked the Laguna Beach area. The 1 bedroom cottage made our trip a wonderful, relaxing trip. As soon as we arrived at the cottage we asked ourselves why we hadn't planned on a longer stay. The Laguna Beach cottage was very quaint and comfortable with all the conveniences to make our stay perfect. The location is perfect at the North end of the Heisler Park and the Laguna Beach commercial strip. We enjoyed watching the sunset behind Catalina Island while we sipped wine on the front deck. We look forward to returning soon. The last week of June to Labor Day there is a free trolley that takes you to town, and passes by every 30 min til 11PM. Pick it up right across on Coast Hwy, so fun. Take it to the Village, the summer Sawdust Festival, and Art shows. Also, our location provides walking proximity to Laguna's famous art gallerys, fantastic restaurants, and shopping. Dive shop w/ wet suits, fins and other supplies one door away. Supermarket w/ Starbucks one block. 30 min N to Disneyland, 40 min S to Legoland, 90 min to San Diego, Zoo, Sea World and more. Crystal Cove Historical restored shacks and restaurant 3 min, Pelican Hill resort and golf 7 min. Great mall upscale shopping in Fashion Island (15 min) and So Coast Plaza (25 min). Our property is 1 of 36 PERMITTED short term rentals in all of Laguna Beach. The City is aggressively shutting down non permitted short term rentals. We can guarantee we will be open for you when you arrive. We are one of very few permitted short term rentals in Laguna Beach. The majority of short term lodgings (STL) on this site in Laguna Beach are non permitted. The City is agressively pursuing the non permitted STLs to shut them down. We can guarantee we will be open for your arrival and stay. Our criteria: Jan, Feb, Mar: .Monthly rate is minimum 31 nights; No bed tax charged; 2 adults maximum for monthly stay, or occasional guest; monthly rate is for one-two guests .Weekly rate is for one-two guests, based on two week minimum stay. Our nightly rate (less than 31 nights) is minimum 5 nights: This cottage is not suitable for four adults. Rather it is suitable for a single, a couple, or a family with 1-2 adults and 1-2 minors under 16 years old. 12% Laguna Beach bed tax on nightly rate. One-time cleaning fee 225.. $600 refundable security deposit Thanksgiving weekend $325/night, We cannot accommodate pets. Bookings are reserved upon receipt of signed rental agreement and payment. For security reasons, we do not keep this public calendar up-to-date. Please text me directly rather than through this site to get the fastest reply and best rate: 818-383-1499.